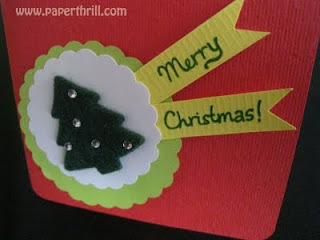 Ho ho ho....Christmas Day is another month away and it's the time of the year of giving and celebration and you can start the festive season by sending cards to you love ones. The colour red is always synonymous with Christmas. Here we have a set of 3 mini red Christmas cards of various design. All incorporating things you find during this season-pine tree, snowflakes and of course alot of LOVE!! This collection of cards exude the beauty of butterflies. It consists of three different types of design, all centering on the butterfly theme. 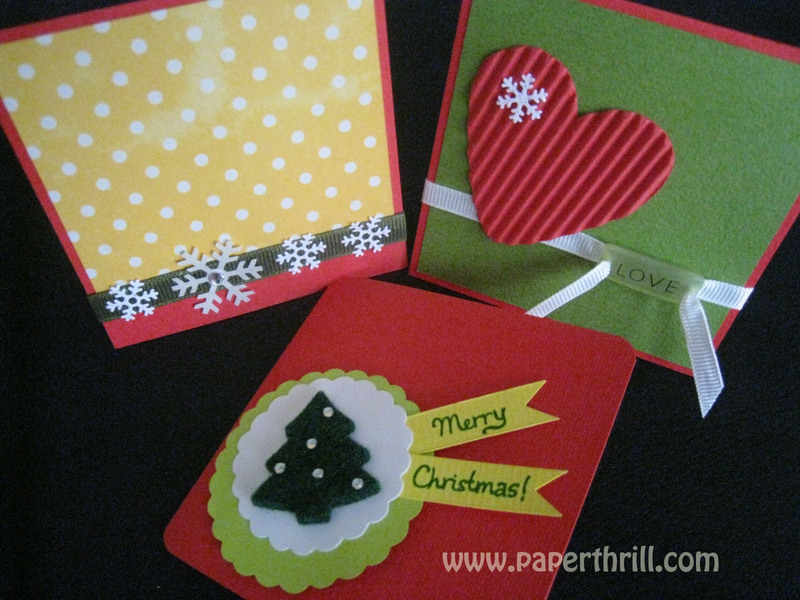 This is an all season greeting card set, meaning that the greetings on the card can be customized to other greetings like birthday, graduation, thank you, get well and many more. The elegent flitterings of butterflies make this set of cards perfect to celebrate any happy occasion. 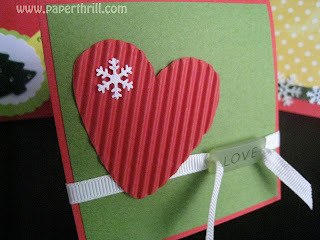 Sprigs for flowers and vines are stamped on each card in various complementing colours. The butterflies are handstamped and cut, and dotted with beads for added elegance. They're raised slightly on each card in order to create depth. The wordings 'Congrats' can be changed to other greetings. Any milestone in a baby's growing years is something to celebrate. Same goes to a baby's first haircut. We received an order for handmade invites to a baby's first haircut ceremony. 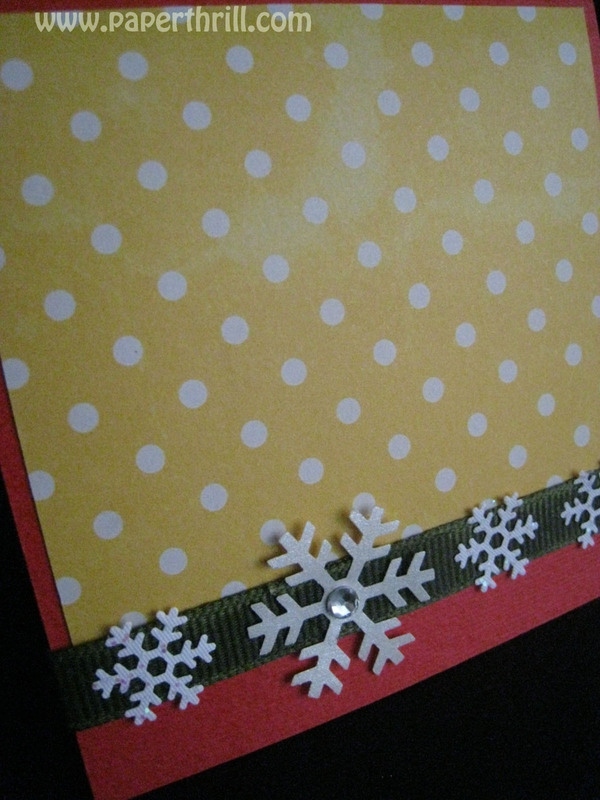 Our client wanted the card in a shape of a baby's jumpsuit initially. We decided to turn it into a little dress since it's for a baby girl. The pink handmade baby dress invites are stamped with pearlescent gold flower vines and dotted with sparkling flowers around the hem of the dress. White organza ribbon is tied with a bow around the waist of the dress. The end result was a super angelic baby dress fit for a baby princess. 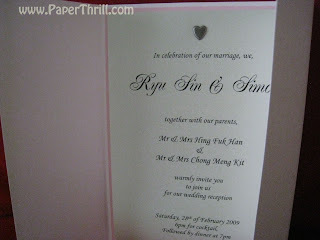 The invitation wordings were printed on a separate pastel purple inlay. We received alot of request whether our cards can have both english and chinese invites on it. This handmade wedding card was specifically designed for that purpose. A pearlescent pink cardstock was chosen as the base and wrapped with a band made out of a love-print vellum strapped with a pastel pink grosgrain ribbon. 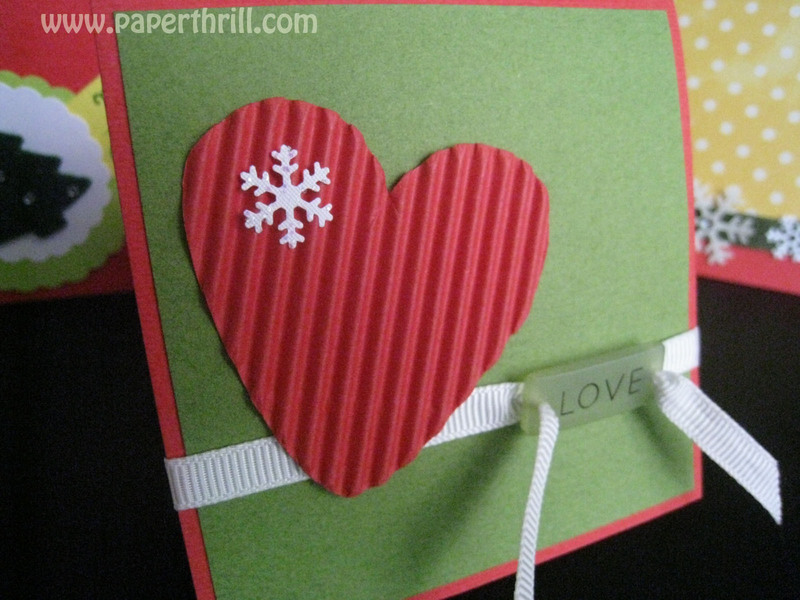 Ribbon is fastened with a love brad for added sweetness. 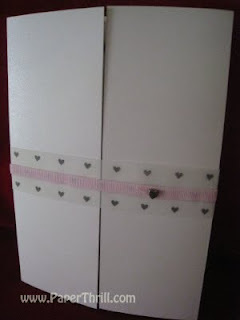 For the inside of the card, a brighter pink cardstock was added as a backing layer before the invites are fastened on top using another bigger love brad. 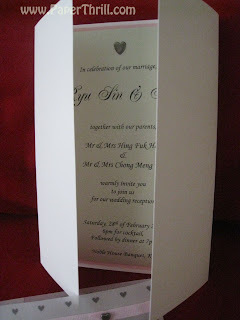 Couples can opt to put 2 invites on top of each other or they can have the map inserted together with the invites. Guests can just flip through the wedding invites for more details.